Happy Thursday my book chatters. Hope you are all having a fantastic week. Has Spring sprung for you yet? It's teasing us here, but at least it's warmer here than it will be in Germany. Anywho...today, our co-host is Ashley of This Unscripted Life. If you did not know this yet, you should know that Ashley and I have been friends since 2004. She and I lived in Germany, both newlyweds and on our own for the first time. We bonded right away and became life long friends. We even had our first babies within 3 months of each other. Even though, we don't live near each other anymore, we still remain close, and when she began blogging, I was ecstatic...now we are as close as ever! 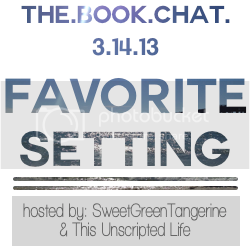 Okay, so for today, we are talking about our favorite settings. When a book has the power to transform you, to take you someplace amazing and mysterious, then it's really all in the setting then, isn't it? When a setting is truly part of the story, then it becomes something much more than a place. It's not often that I pay much attention to landscape or setting, but these two books' settings had a major effect on me. This entire series takes place in the Seven Kingdoms. I cannot get enough of it. The scenery is gorgeous, the characters are intriguing, there is magic and mystery imbedded in the landscape of the stories. I hope she never stops telling stories in this world. You hear that, Cashore? Get to work. Thank you. Might I suggest something in Monsea? Just a thought. Carry on. This HAS to be made into a movie, for setting alone. And it better be MAGICAL. The setting made this book. The story is good, the characters are phenomenal, but the magic is all in the setting, Le Cirque des Rêves. I sighed even while typing that name. Each finite detail of the circus is intricately woven through Morgenstern's artistic writing. It's so incredible. Each tent of the circus stretches your imagination beyond what you have ever imagined before. I want this circus to exist! So, let's hear it. What is your favorite setting? It can be real, fictional, past, present or future. How did the setting effect the story? What do you love about it? I'm still looking for a co-host for next week, so let me know if you're interested!! Awww I love you! I miss you! You are fantastic! Spring has definitely not sprung here! Errr! I really want to see The Night Circus turned into a movie too. I think it would be stunning visually. My favorite books are ones that seep into my dreams at night. I wake up and want to go right back to sleep to be inside that world again. That book definitely had that effect on me. I wonder if it's ever going to be Spring! We had a couple in of snow over the weekend and 3-6 forecasted for next week. I'm very over winter. 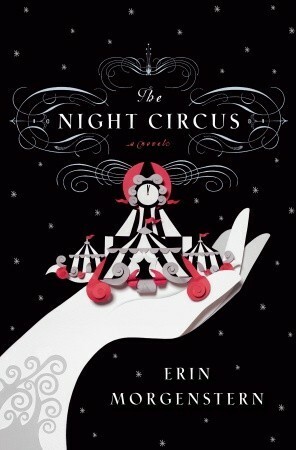 I think The Night Circus is one of those books that would look amazing on the big screen. Erin Morganstern writes such vivid imaging but I'd be afraid some director would try to change it. That should be a rule "Don't change the book". I've been so excited for Spring, which has been here since at least mid-February, but I'm in Texas, which means that next week it might snow. Weather goes up and down like a yo-yo all.the.time. I can't believe I haven't read Graceling yet. It sounds like my kind of book but I'm a bit overwhelmed by all the love everyone has for it. I agree that The Night Circus has the most beautiful setting. However, I'm not sure I want it to be made into a film. Sometimes I think book descriptions can do a setting a lot more justice. I don't know how well the magical quality will translate to the big screen. Oh goodness, this makes me want to jump right into Graceling which I just bought the other day. MUST finish the books I'm currently reading too. I totally agree with you about The Night Circus too, I'd would be so lost in their world I'd forget I was reading. I'm not linking up today, but I'm still weighing in. Hogwarts! Oh my gosh, I still await my acceptance letter! 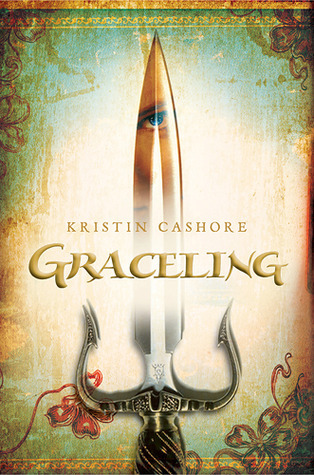 I really want to read Graceling now! I just really need to read The Night Circus already!! Great topic this week. :) I would volunteer to co-host next week, but I'm not currently reading anything. :'( It's a travesty, I know. I didn't finish 50 Shades before I left my last chapter so I had to abandon it haha. So sad ..... NOT. I'm in the same boat as Megan. There is no excuse for me not reading Night Circus! I just love the circus so much. I want the Circus to exist too! Althought "knowing" so much would make it scary. I am almost done reading it and I keep thinking I want to see a movie of it just for the setting. The Circus, the magic, the era fashion, everything! We should do our favorite blog posts to write in one of the upcoming book chats. OH YES, The Night Circus! Though I had some issues with the story, the circus itself was magical and magnificent and I agree that it would make a GORGEOUS movie!